Quad Cities River Bandits infielder Josh Rojas and Burlington Bees RHP Andrew Vinson respectively were named the Midwest League offensive player and pitcher of the week for July 17-23, and Clinton LumberKings shortstop Luis Rengifo was named to MLB Pipeline’s Prospect Team of the Week for that same period. Rojas batted .435 (10-for-23) with three homers, 11 runs batted in, and nine runs scored in six games during that time. A Round 26 draft pick of the Houston Astros this year, he is batting .293 with 8 HR and 23 RBI in 20 games with the River Bandits. Vinson made two starts last week, and he earned wins in both of them. In the first start (July 17 vs. the Lake County Captains), he gave up only two hits while striking out four batters in five scoreless innings. He did slightly better in the second start (July 22 vs. the Dayton Dragons), giving up only two hits while striking out five batters in five innings. A Round 10 draft pick of the Los Angeles Angels last year, Vinson is 7-8 with a 4.88 ERA, 65 strikeouts and 21 walks in 79.1 innings (17 starts) for the Bees this season. Rengifo batted .391 (9-for-23) with three homers, five runs batted in, and eight runs scored in six games during the July 17-23 period. The Seattle Mariners prospect is batting .250 with 11 HR, 41 RBI and 26 SB in 91 games with the LumberKings this season. Last week’s Midwest League offensive player of the week, Dragons outfielder Jose Siri, went 2-for-4 against the Bees on Monday to extend his hitting streak to 30 consecutive games. Not only is that the longest hitting streak in Minor League Baseball this year, it is now the third-longest one ever in the Midwest League. The only two Midwest Leaguers with longer hitting streaks were Tony Toups (35 games for the 1977 Waterloo Indians) and Robert Fick (32 games for the 1997 West Michigan Whitecaps). Siri will surpass Fick if he gets a hit in each of the three games Dayton plays in Lansing from Wednesday to Friday. If that happens, he will aim to break the MWL record during the following series in Fort Wayne. The Atlanta Braves traded LHP Jaime Garcia, catcher Anthony Recker and cash to the Minnesota Twins for RHP Huascar Ynoa on Monday. Garcia pitched in the Midwest League in 2006, going 5-4 with a 2.90 ERA, 80 strikeouts and 18 walks in 77.2 innings (13 starts) for the Swing of the Quad Cities. 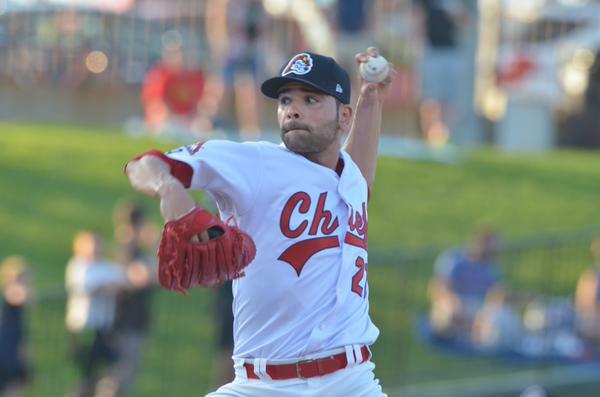 He also made a notable rehab start for the Peoria Chiefs in 2015, striking out six batters while pitching the first five innings of a no-hitter over the LumberKings. This entry was posted in Burlington Bees, Clinton LumberKings, Dayton Dragons, Fort Wayne TinCaps, Lake County Captains, Lansing Lugnuts, Midwest League, Peoria Chiefs, Quad Cities River Bandits, West Michigan Whitecaps. Bookmark the permalink.